Central banks presiding over almost half the planet’s GDP plan to treat global warming as a threat to financial stability. It’ll add heft to existing pressure from investors and make it harder for companies and their lenders to ignore the longer-term impacts of climate change. President Mario Draghi is considering ways to ease the pain that negative policy rates inflict on banks, such as tiered deposits in Japan and Sweden. Savings-rich German lenders would benefit most. But any earnings boost would be modest and does nothing to remedy high costs. Rome has admitted its economy will barely grow in 2019, a climbdown from forecasts. That makes it harder to keep debt in check, cut income tax, and avoid sales tax rises. EU Brexit distractions only delay the eventual choice between popular support and a new financial storm. 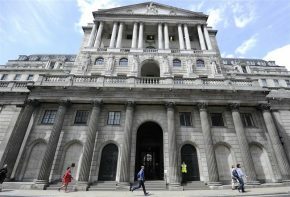 The European Central Bank boss is expected to announce more cheap loans in the coming months. New regulations may otherwise cause a credit crunch just as the euro zone economy is slowing. Monetary policymakers will have little choice but to paper over a two-tier banking system. Chairman Jay Powell told Congress that the U.S. central bank would stop running down its assets this year. That means holding at least $3.5 trillion, four times the pre-crisis figure. That’s not the “normalization” many were looking for – but there are reasons for it. The president says he will delay a tariff hike on $200 bln of Chinese goods. Tweets imply he will ease up on Huawei too. Wall Street wobbles have pushed the White House toward a quick-and-dirty deal which empowers Beijing hardliners, and benefits neither side in the long run. Harare has conceded that its electronic “zollars” are worth 60 percent less than it had claimed. Yet black market valuations imply the currency is still overvalued. The moves could rile citizens without spurring the investment Zimbabwe sorely needs to fix its battered economy. For the first time since 2013, no country in the MSCI World Index is seeing more earnings upgrades than downgrades, Morgan Stanley says. The phenomenon usually coincides with U.S. or euro zone recessions. That augurs poorly for an incoming raft of economic data. Inflation in the U.S. and the euro zone is easing and looks set to subside further. That will help the Federal Reserve boss justify a pause in rate hikes, but is a headache for his European Central Bank peer who has yet to tighten monetary policy and has less room to manoeuvre. A decision to ease efforts to reduce the fiscal deficit will dent the government’s prudent reputation. Yet support for farmers, a new pension scheme and a higher effective tax exemption, even as revenues fall short, will give the prime minister a better shot at a second term. The economy contracted for the second quarter in a row at the end of 2018. Rome is increasingly likely to miss a budget deficit goal of 2 pct of GDP but will get away with it. Imposing austerity during a broad-based euro zone slowdown makes no economic or political sense. The European Central Bank boss said growth may slow but offered no fixes. Resuming bond buying would be controversial, and a rate cut could hurt the financial sector. Renewing cheap loans to banks is his likeliest choice. The only question is how generous his terms will be. Jerome Powell says the U.S. central bank will be patient in weighing new rate moves. Previous hawkish comments unsettled investors, helping tank stocks last month. The two are learning to read each other, but a data-dependent message may get tricky if the economy starts to turn. The central bank says it will slash the amount lenders need to hold in reserve, freeing up a net $117 bln. It’s not full-blown stimulus. Still, an easing move on the eve of talks signals Donald Trump may be right: China’s economy, and its negotiating position, is weakening. Most of those vying to replace Mario Draghi at the European Central Bank lack his creativity. Others will have more scope to sway debates. Ireland’s freethinking Philip Lane is favourite to be chief economist. He would have outsized influence, especially in the next downturn. With the region’s bad-debt crisis on the wane, supervisors will shift their focus to probing lenders’ risk models and 132 billion euros of hard-to-value assets. For banks which had previously relied on their own guesstimates, that could mean higher capital charges.